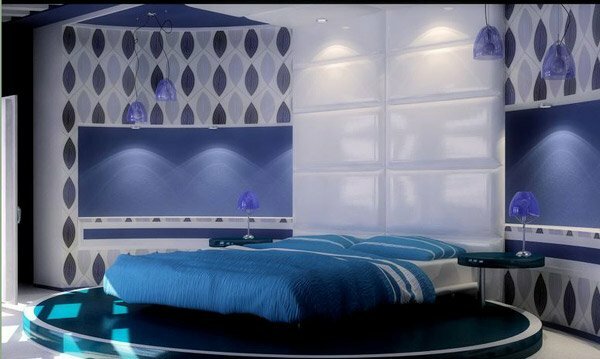 Serenity and calmness are few effects of having blue interiors. A lot of people love this color because it is everywhere. It reminds us of the summer sky and the vast majestic oceans. It makes us feel nature. An interesting hue indeed and that is what we are featuring in today’s article. Though colors draw different kinds of emotions depending on one’s culture, we are going to talk about it in general. Blue for this matter was said to have a relaxing effect. This is when used in lighter hues. The lighter it is the cooler it becomes which is just perfect for your sleep chamber. However, when used in darker shade different emotion is invoked. Darker shade of blue creates a sad appeal. So better be careful in putting such color on your interiors, especially if you are going to use it on your bedroom walls. It might just amplify a negative effect on your mood making it harder for you to relax or get a rest. 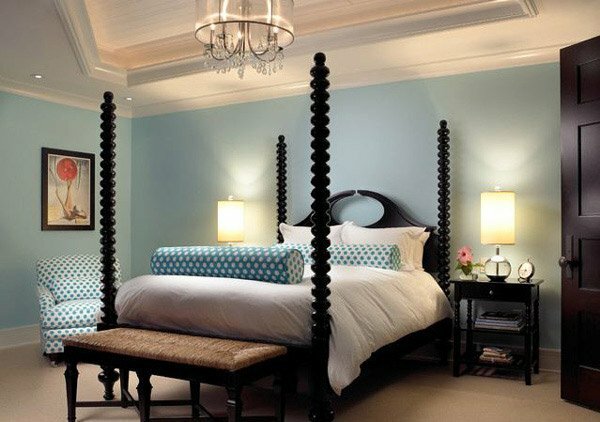 Need not to worry if you really cannot get enough of navy blue or darker shades of this amazing color because we have picked a different hues of blue bedroom designs perfect for a peaceful retreat. This is one sophisticated, modern bedroom design. Geometrical- inspired interior design that uses blue to make the room pop. An impressive bedroom design! The combination of tropical ambiance and modern functionality made even better with the usage of such a relaxing color scheme. A bright aqua blue is all fun and beauty! This wonderful bedroom design draw its inspiration from the duvet fabric and so as you can see all the hues of turquoise are present everywhere in this room. 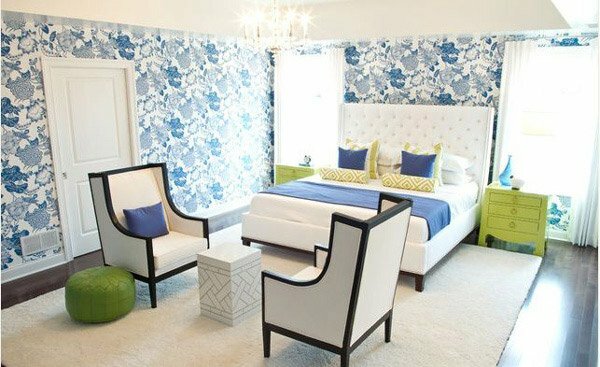 We love the pops of colors in this refreshing blue bedroom design. The bold printed wallpaper that covers the room creates an exciting ambiance that complements the classic white furniture. 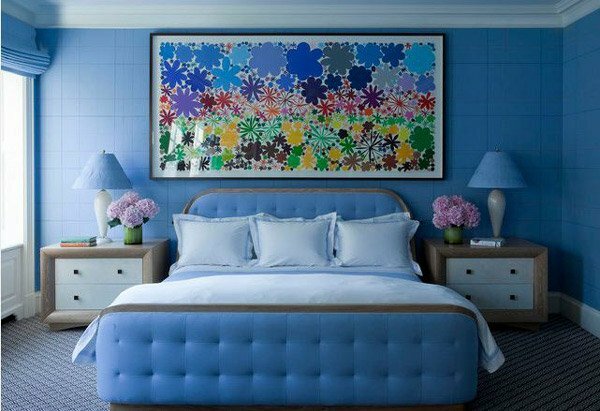 The colorful painting is a great focal point in this cozy bedroom. It added fun and modern touch to this traditional design. When choosing dark hues like this bedroom interior, the trick is to match it with neutral colors for a sleek and sophisticated finish. Striking deep black accent against a sky blue interior is sure to immediately bring drama and boldness to a room. Steal this amazing playful yet sophisticated bedroom design by mixing plains with colorful patterns. 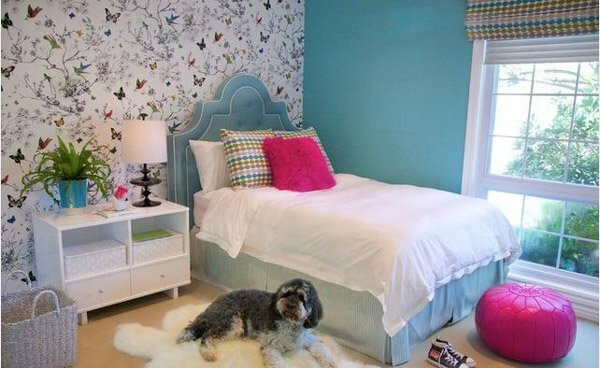 Sky blue accentuated this bedroom with chunks of it creating a funky yet elegant appeal. 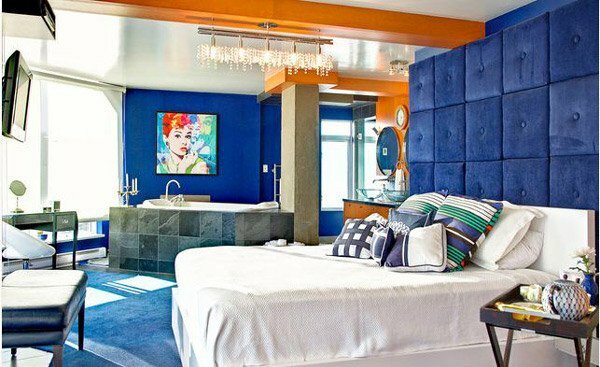 We love the color scheme in this bedroom design. 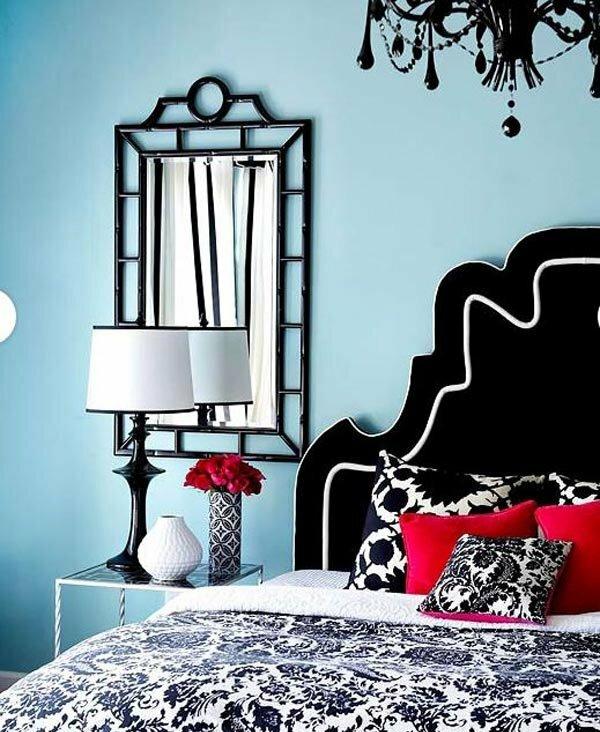 This shade of blue matched with the intricate details of those black and silver bedroom accessories creates a dramatic and glamorous atmosphere. 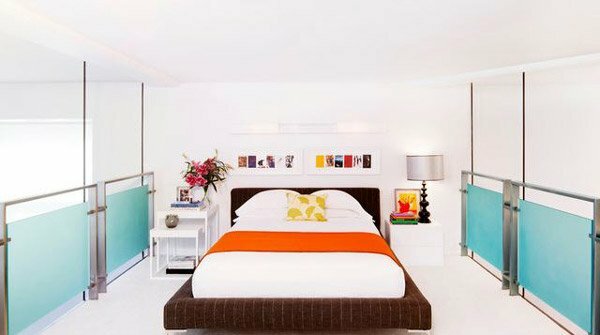 The addition of bright colors in this almost-all-white bedroom design makes this modern room standout. 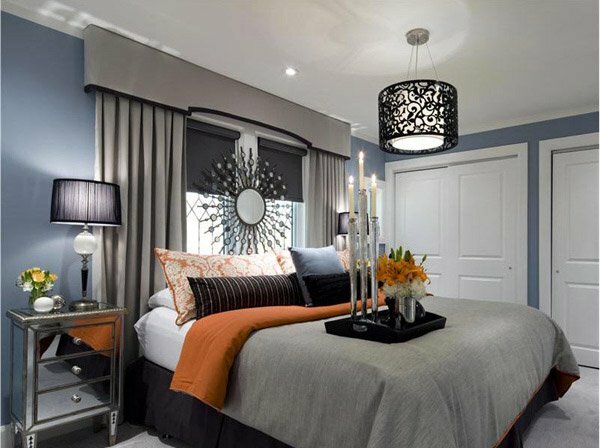 The combination of colors in this modern bedroom design creates a cloudlike ambiance. Turquoise is a perfect match to an apple green accent like this wallpaper. The combination of which creates a fantastic result, pops of apple greens in this room makes it playful even more. Rich warm wood color balances the coolness of light blue and also adds an instant elegance to the bedroom. 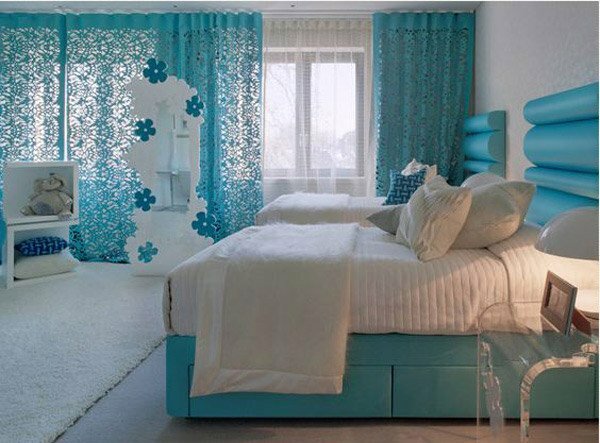 Turquoise accent makes this already-modern design into a fabulous ultra-modern bedroom. 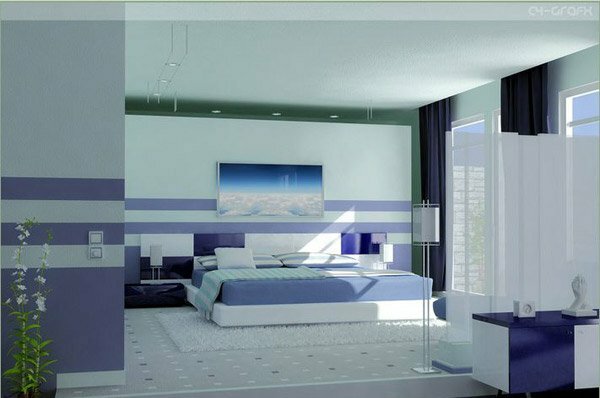 There you have the blue bedrooms idea that we’ve gathered specially for you. Blue is a very versatile color. Like a denim pants you can pair it with just about any colors. So be playful and bold. Do not be afraid to try bright colors just make sure to balance it out with neutral hues so it will not be too overwhelming. You can also try getting an Invigorating Red Bedroom Designs.